Pipe(line) Dreams is a cross-platform documentary project that takes viewers on a journey along the Chad-Cameroon oil pipeline. The pipe(line) dream began with a vision. The Chad oil project – the largest energy infrastructure project ever undertaken on the African continent – would show the world that oil could be a force for good. A consortium of multinational corporations led by ExxonMobil would develop Chad’s oil fields and construct a 1070 km. pipeline to the Atlantic, transforming a region in the process. Cheerful corporate publications predicted the oil would help lift some 6.5 million Chadians out of extreme poverty and provide the citizens of Cameroon with desperately needed revenues. The World Bank called the pipeline a “unique opportunity” and joined forces with the oil companies, investing funds and lending a legitimacy to the project that helped the consortium secure further financing on international capital markets. In return for the World Bank loan package, the government of Chad even agreed to put 85% of its oil royalties into poverty-reduction projects. The petroleum curse lifted, oil would at last become the engine for real economic development. So what happened to the promise of a better life for the region? And what do those living with this “extraordinary project” have to say about it? To explore the gap between dreams and reality, we travel to Cameroon and Chad to take a closer look at this saga of oil and development. 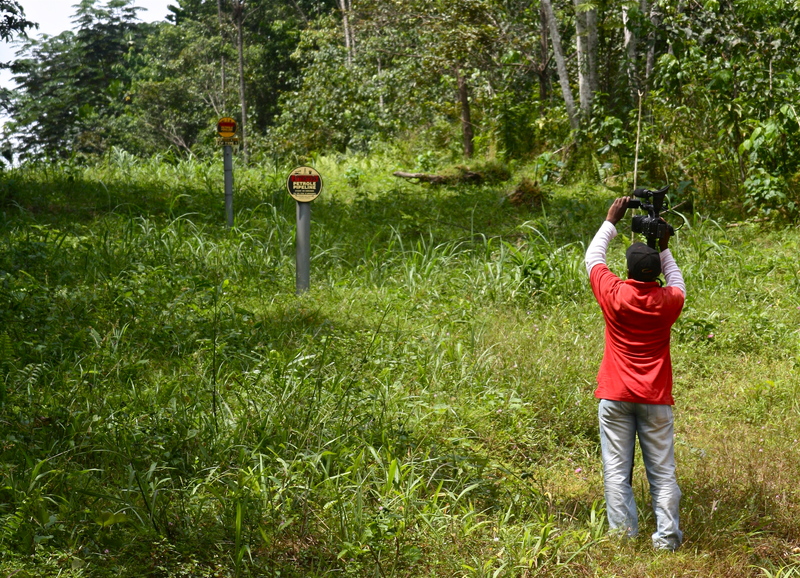 Camera in hand, we retrace the story of the US$4 billion dollar “oil as hope” project, following the path of the pipeline from its loading terminal at Kribi on the Atlantic coast of Cameroon to the source of its payload, the Doba oil fields of southern Chad. Traveling through the rainforests of southern and central Cameroon and across the savannah towards the lowlands of Chad, we visit with villagers, pipeline workers, local journalists and community activists. Pipe(line) Dreams is a filmic journey, an odyssey marked by startling encounters with Cameroonians and Chadians, whose rarely-told stories reveal something of the complex relationship between oil and African development. As we travel from Kribi to the Doba fields, we train and equip Cameroonians and Chadians with mobile phones, building a network of professional and citizen journalists who become active participants in the project. Their text messages, photos and video dispatches uploaded to the project website give voice to the people presented in the film, changing the typical (Western) viewer/(African) subject relationship into a more meaningful and productive multi-directional conversation. This grassroots network transforms Pipe(line) Dreams into a living project, whose participants are able to update stories as changes occur on the ground, post environmental alerts, connect with audiences, or provide testimony at relevant meetings and hearings. The multi-directional nature of web communication also allows project participants to dialogue with people elsewhere in Africa – in places like Ghana and Uganda, for example, where oil production is now underway – confronted with the challenges of linking oil production to socio-economic development. Pipe(line) Dreams represents a new model of documentary filmmaking, empowering the traditionally under-represented subjects of the story and promoting civic engagement long after the filmmakers have gone home. The initial phase of the Pipe(line) Dreams project work was made possible with the support of the Pulitzer Center on Crisis Reporting, Frontline World and The Center for Investigative Reporting.